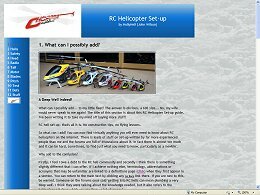 This page is just a link to my remote control model helicopter set-up guide. You can enter the guide on any page, using the links on the left. However, if you are new to RC helis (and it's 'newbies' it's primarily aimed at), I would suggest you start with Section 1, the introduction: 'What can I possibly add?'. If you would rather go to his site in this browser window, there is a link, but I wont tell you where. Return to GatleyGallery on this and all other guide pages is via the graphical link at the bottom of the menu bar on the left or the text link at the bottom of each page.